Last night the lady -I have been takeing care for 10 years- passed away at hospital. She had been very week and sick for a long time and I was expecting this. It was her time to go and I’m sure it’s better for her, cause I saw how much she was suffering lately. I will take care of all the common memories and I wish a peacefull last journey to my frend! Let angels be there by her side! She flyes away like a bird. She flyes free without worries. She flyes to another land. To a land where gras is greener. To a land where one can start over and never suffer again. This is a great song which is describeing my feelings well right now. I think it’s mostly because during last days I have had so low energy level even I have slept little more than before this period but still…It’s not all about time. I have been wakeing up again and again every single morning and I think I haven’t slept deep sleep enough. It makes one easily feel weard and surreal. In other night I had a very weard dream. I saw a dream where I was at my childhood home. Suddenly there was a snake and it bited me. My hand swelld. It was like I have had a big blister in my hand. Someone first said it’s only a viper and that it’s perfectly harmless. Then some other said it could be after all other dangerous snake. I was scared and was gonna go to pharmacy. Then I woke up. This week my mothers and fathers remembrance was tested. My mother got quite low scores and that’s why she needs more tests but my father surprisingly passed that test which I would never believe cause he these days asking always the same questions again and again. Mom also forgotten things easier than earlier but I thought she’s little bit better than dad. Till the next time…Take care! In this time of year you gonna need lots of yummys so that you can survive in this darkness (or polar nights). 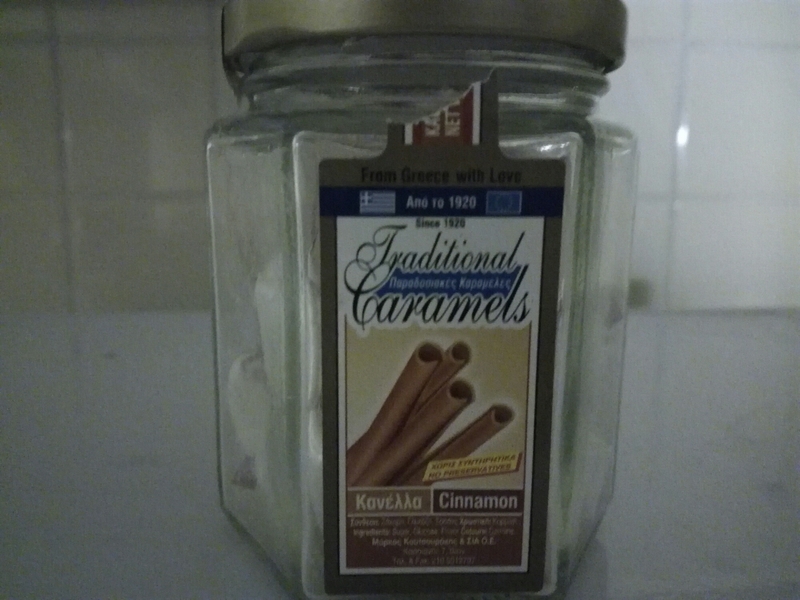 Sugar is maybe not the best energy source but atleast I can’t live without it (specially now). 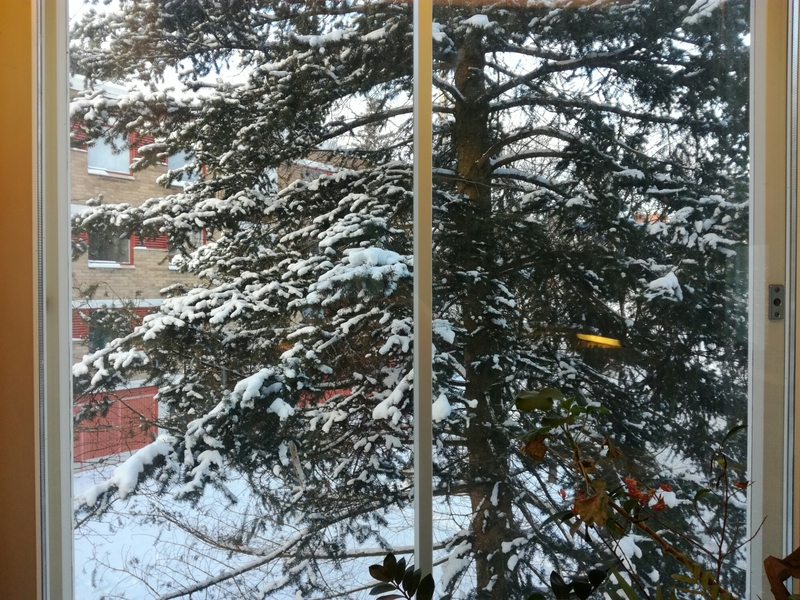 Luckily this season is not lasting so long anymore now when we’re already in spring period. 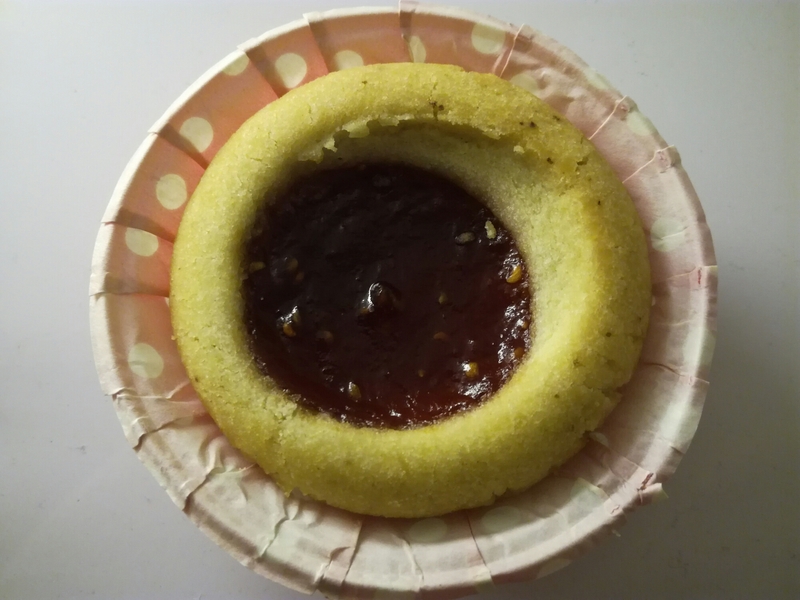 In this post I will introduce you some finnish delicacys which (mostly) have helped me. 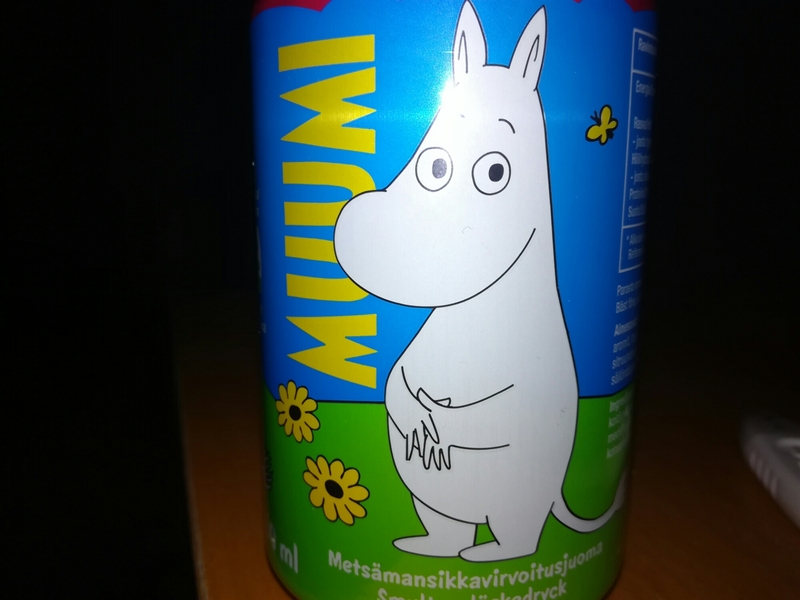 Moomin soda. It tastes wild strawberry. Yammy! That I should by…”Slow for a while”-chocolate. …and that too. ”On the go again”-chocolate. I’m always going somewhere. 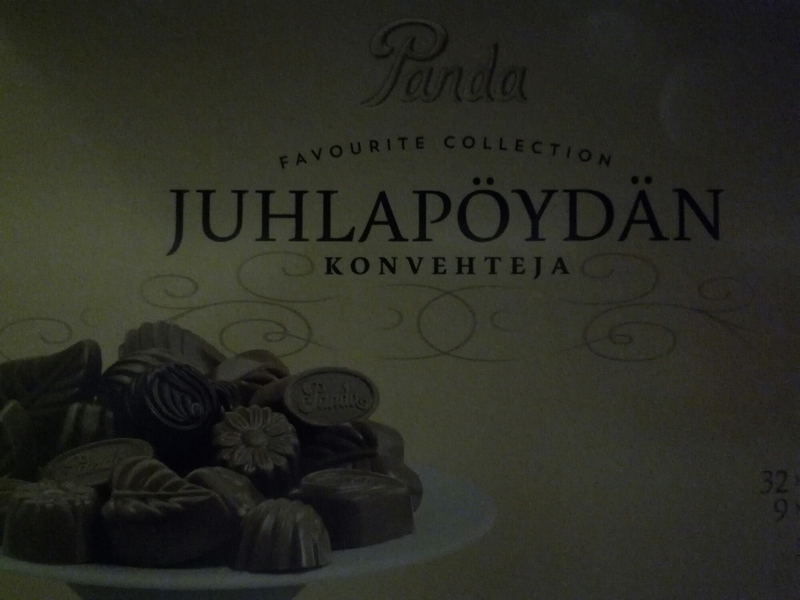 Panda chocolate is usually good. I think these are too. Banana cream pudding. 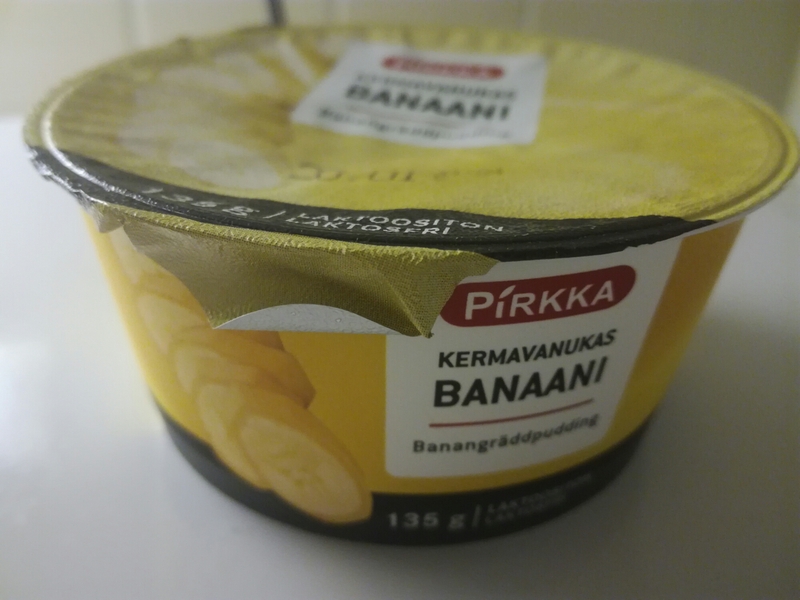 Pirkka is good and cheap brand. 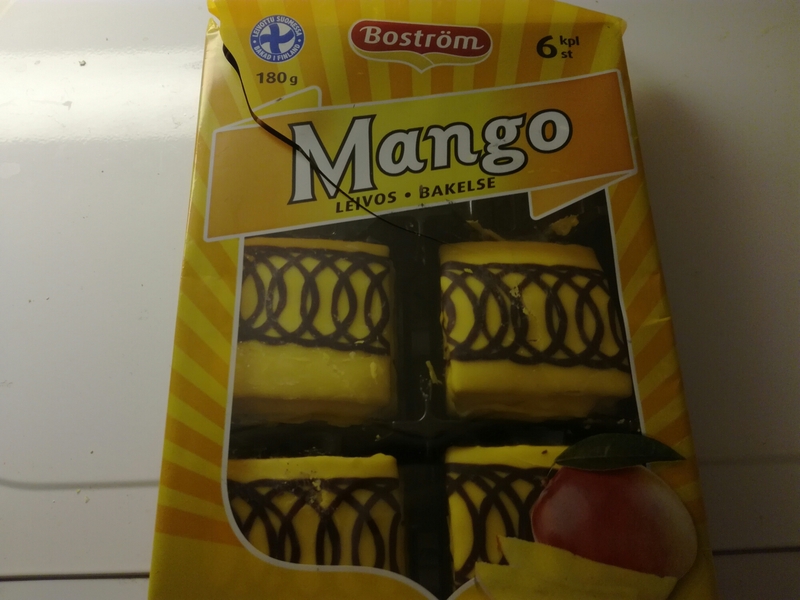 So try these if you com to Finland! In this video they use a word ”kiitos” in meaning ”pleace” but we don’t actually have the word ”pleace” in finnish language. 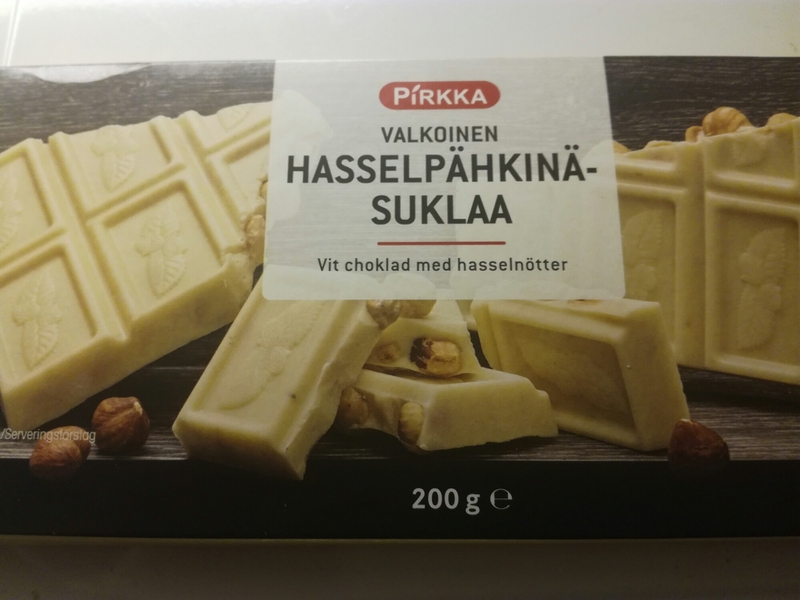 ”Kiitos” is the same as ”thank you”. You can use it like the word ”pleace” but practically we don’t use it like that. We just say: ”Yksi olut ”or ”Yksi kahvi” which means: ”One coffee (pleace).” Actually that tells a lot of finns. We don’t use any extra words cause we don’t flatter or need to be extra polite. We’re straight and honest if you know what I mean. Another thing what I noticed was that part where they’re at the tram and show how unsocial people are. I have to say it’s not always like that. For example foreigners we do help gladly but otherwise we don’t much talk to strainge people. Women maybe do that little bit more than men…or men can do that when they’re drunk. I do talk sometimes for strange people and specially for few of my neighbourghs who’s very Social…but the truth is I haven’t always energy to talk everybody (or anybody). Sometimes it would be nicer just to be with your own thoughts and for example write this blog but I don’t dare to be quiet if someone is talking to me. I decided to post more videos from Finland cause it’s our 100 year anniversary this year like I earlier told you. These beautiful videos are the first ones in this serie. Those are from this years light show in Helsinki. You must see those! Enjoy videos and have a nice evening…and weekend also! Friday wasn’t very good day anyway. When I was on my way to work my train way stopped. First they only said that there was trouble with lights then after we did wait a while they said there was a faulty train ahead us and that they don’t know when we can move on. Nice! So I had to chance train to bus. It was so cold to stand at the bus stop and wait the bus. Have you seen the ballet movie Billy Elliot? Where that little boy wants to be a ballet dancer but his father don’t like it. This movie came today at television. It’s my favorite movie. Here you can see the clips of it. That’s my frends present to me from Rhodos. I have to Say I didn’t like these. I thought that candy is always sweet but I was wrong. These wasn’t sweet at all. Instead of that last time we saw we went some new cafe where I drunk lovely chailatte with espresso. So yammy! We also eate at one vietnamise restaurant which is very cheap but good place. This was my (only) christmas present (in packet). 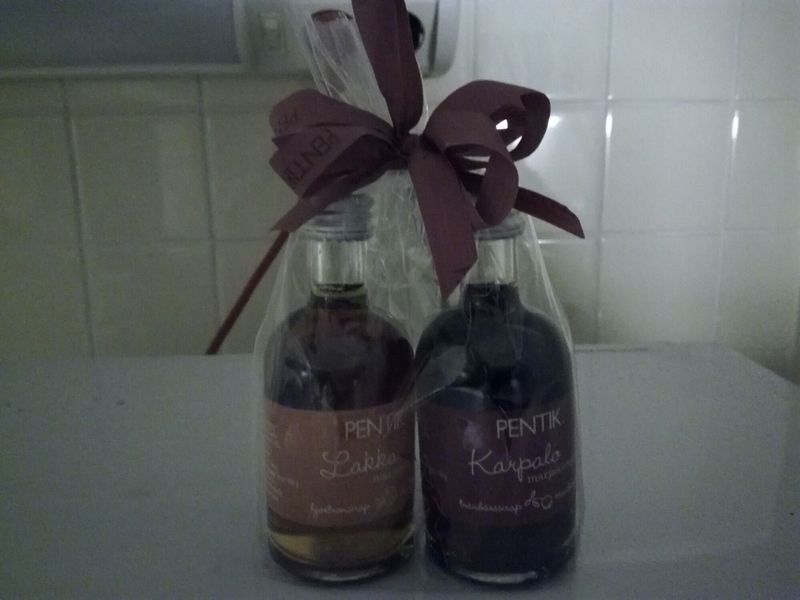 These syrups are surely tasting good. There is cloudberry and cranberry tastes. Should try these! In addition I got money which is allways nice so you can by what you really need! Now I must sleep. I’m very tired. So good night! I finally made it! 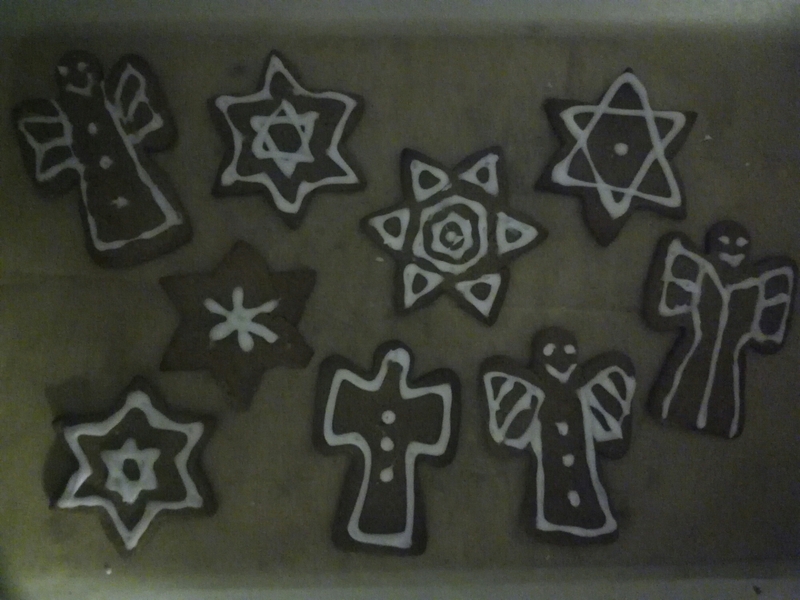 I made those ginger breads yesterday which I was gonna do much earlier. I just didn’t have energy because of my sleep debt. 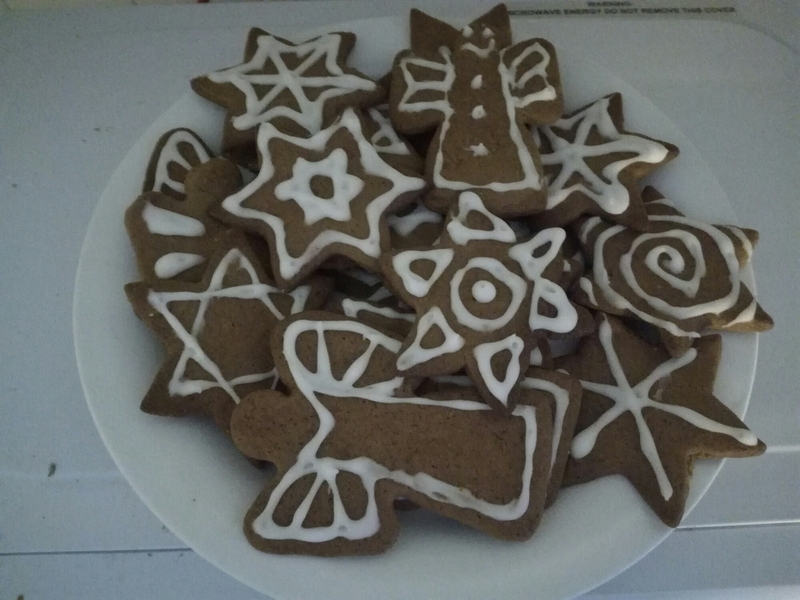 Anyway now those are ready (as you can see of my pictures) and those are really good (though I have to admit I used a frozen paste from grocery store)! I love that frosting! It’s not only beautiful and fun to do, it also tastes great! I had a little bit troubles to get those ginger breds stay whole cause I didn’t have flour and the paste was little hard to handle because of that. I had to make a little fat ginger breds so they stayed whole (even thin is more stylish I think). 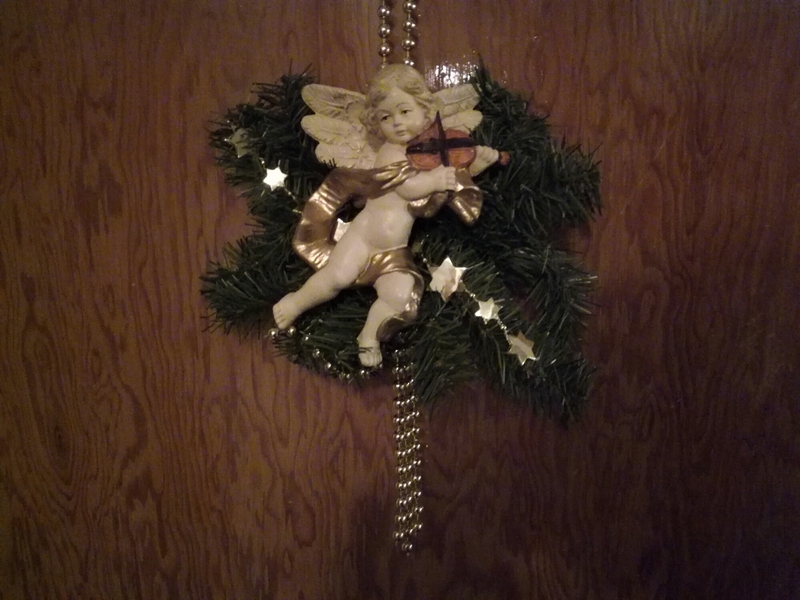 So I have a little bit fat angels now. 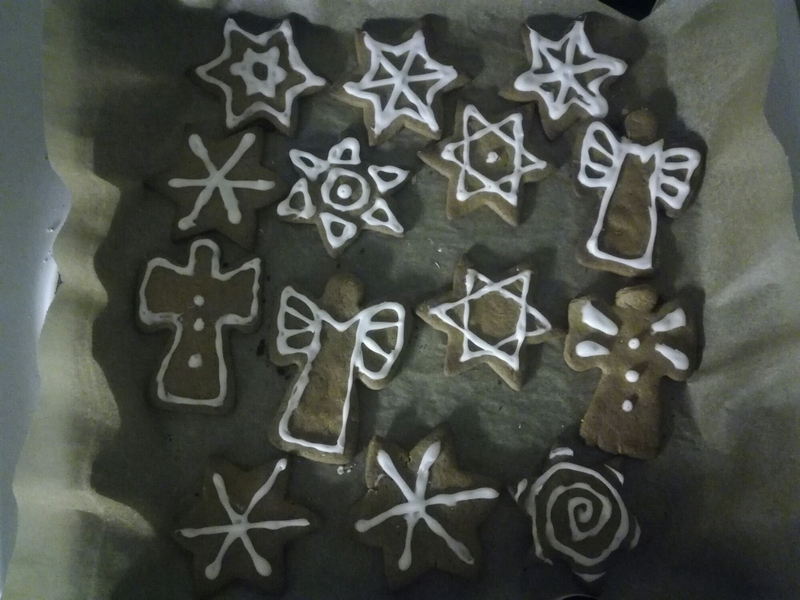 Maybe those angels did eat too much at christmas…By the way, this was my first time I made angel ginger breds. Their head and wings was in danger…but I finally broke only one. not to warm glogg with using an aluminium-or metal pot! Those can be severing some contaminants in your drink. the best way to warm glogg is warming it in microwave. Then it can be also parboiled. Otherwise it’s not recommended even if you have non alcoholic glogg. If there is alcohol it will evaporate and if there’s not the taste can still be enduring of parboiling. if you use a pot remember to use a pot where’s intact base. 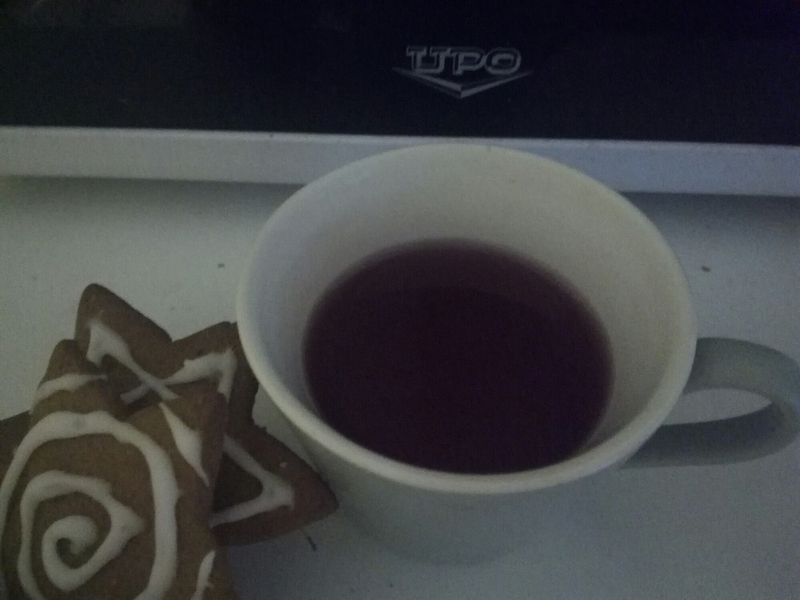 Glogg and ginger breds…so good! It’s 2017 now. 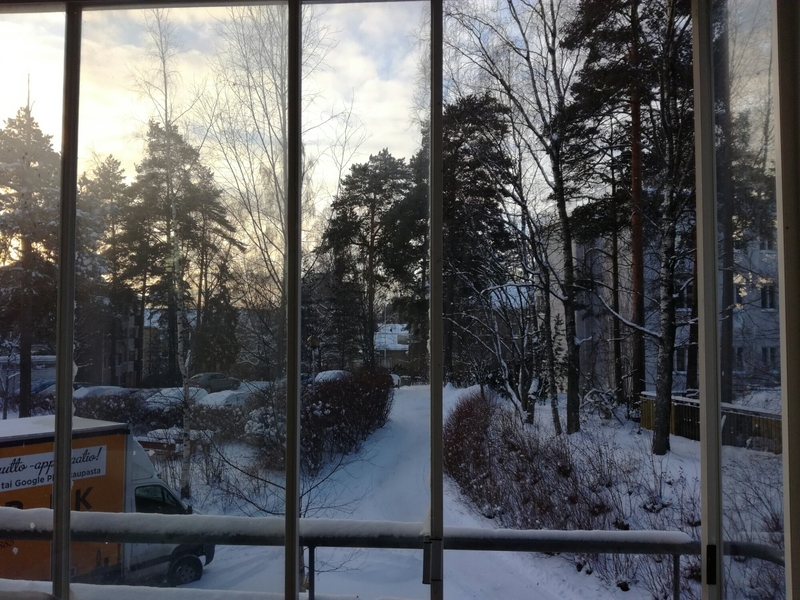 ”New year and new tricks” as we say in Finland. 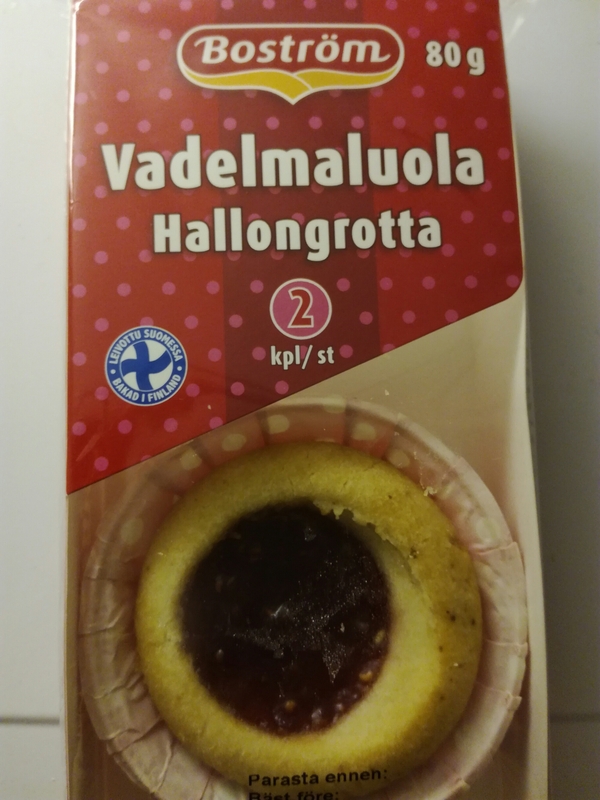 So same in finnish: ”Uusi vuosi ja uudet kujeet”. 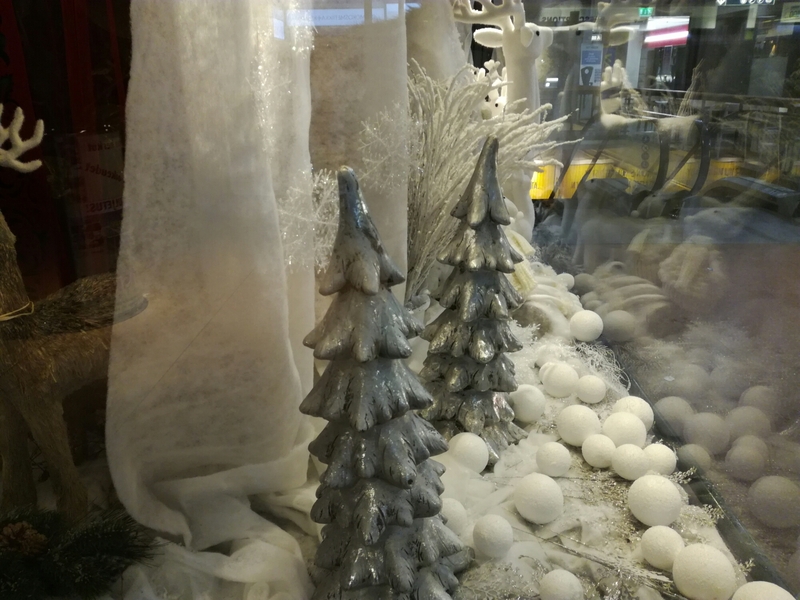 Have a nice new years first week!